[embed:12612866]Everything you need to know about how to watch Sunday's second round games of the 2016 NCAA tournament. Half of the Sweet 16 field was set on Saturday, and on Sunday, eight more teams will advance to the regional semifinals. At least one double-digit seed is guaranteed to get there, with the possibility of as many as five. This group of teams gave us one of the single most unpredictable days in the NCAA tournament’s history on Friday. Let’s see what they have in store for their encore performances. When Iowa was at its best earlier this season, its defense was playing nearly as well as its offense, which is led by senior forward Jarrod Uthoff and junior guard Peter Jok. If the Hawkeyes are to advance to the Sweet 16, they’ll need to find at least a measure of that defense to slow down Villanova’s offense, which is ranked 10th nationally in adjusted efficiency, according to kenpom.com. That’ll be easier said than done against the Wildcats' elite two-point shooting, which features four guys connecting at a minimum of 52.2%. The Lumberjacks are a small-conference power that gets it done with defense, as West Virginia learned all too well on Friday. Given their deliberate style of play, however, Notre Dame, with its No. 11 offense by adjusted efficiency, is likely a tougher matchup. Junior forward V.J. 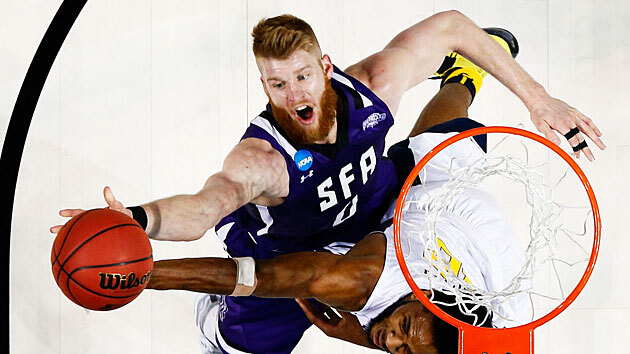 Beachem in particular will be a tough cover for Stephen F. Austin, which can counter with senior wing Thomas Walkup, who scored 33 points against the Mountaineers. ​Shaka Smart may have left Richmond for Austin, Texas, but the Havoc defense he made famous sure didn’t. The question now is whether or not that pressure D will be enough to discomfit Buddy Hield and the Sooners. It’s worth noting that Oklahoma went 2-1 against West Virginia, aka "Press Virginia," this year, and it was a waved-off halfcourt buzzer-beater by Hield in the Big 12 tournament away from sweeping the Mountaineers. This is the second-round matchup we were all expecting from this pod, right? Syracuse went from being one of the last teams in the field to being favored to reach the Sweet 16. The Blue Raiders were one of the best three-point shooting teams in the country this season, and that showed up in their monumental first-roound upset of No. 2 seed Michigan State, when they went 11-for-19 from deep. They’ll need a similar shooting performance against the Orange's 2-3 zone to advance. The Rainbow Warriors put on an impressive showing against California in the first round, but the Golden Bears were without guard Tyrone Wallace (broken hand) and Jabari Bird (back spasms), while Cal's two freshmen stars were either ineffective (wing Jaylen Brown, four points) or burdened with fouls (big man Ivan Rabb). Maryland is healthy and may be even more talented than Cal. The Terrapins, a preseason top five team, fell short of expectations this season, but they beat just about every team they were supposed to, with the exception of a loss at Minnesota. They should win this game. Northern Iowa pulled off one of the most thrilling victories of the first round, knocking off Texas on a banked in, half-court buzzer-beater by Paul Jesperson. The Aggies, however, are really clicking and have a veteran-laden team that won’t be cowed by the moment. The Panthers are going to have their hands full trying to slow down senior guards Danuel House and Jalen Jones. Get all of Michael Beller’s columns as soon as they’re published. Download the new Sports Illustrated app (iOS or Android) and personalize your experience by following your favorite teams and SI writers. The clashing tempos of Xavier and Wisconsin should make for an interesting test of wills in their second-round matchup. These are two evenly matched, similar looking teams, though the Musketeers have more players who can create their own shot. That will be a key against the Badgers' strong half-court defense. Saint Joe’s doesn’t turn the ball over, forces opponents to work long, patient possessions and shoots better than 52% on its two-pointers. That’s a great formula against a fast, lethal offensive team like Oregon. The matchup between Ducks' forward Dillon Brooks and Hawks counterpart DeAndre Bembry may hold the key to the outcome.